Join PAMF Dermatologist and parent Dr. Amy Adams for a brief informative talk on sun safety. On Wednesday, March 7th, 2018, the Executive Board of the Palo Alto Council of PTA’s unanimously resolved to strongly support the participation of PAUSD students in the National Student Walkout of March 14th in support of actions to end gun violence. The Executive Board hereby resolved to support students’ rights to acts of civil disobedience and to exercise their right to free speech. The Executive Board urges the district to ensure that no student will be threatened with or experience punitive action as a result of exercising their rights beyond an unexcused absence. Free with RSVP: https://mariecuriefilmjan20.eventbrite.com –Space is limited! As one of the world’s most renowned scientists, two-time Nobel Prize winner Marie Sklodowska Curie is best known for pioneering the field of radioactivity — but few understand the obstacles she faced just to get into the laboratory. This film invites audiences to meet Marie Curie as she recollects her quest to isolate two elements —polonium and radium. From her childhood in Poland to groundbreaking research in France, Dr. Curie shares the struggles, failures, and triumphs behind her scientific discoveries and remarkable collaboration with companion scientist and husband Pierre Curie. 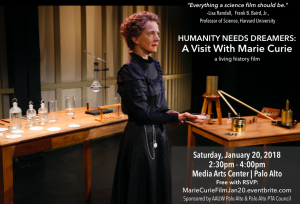 Masterfully portrayed by living history scholar Susan Marie Frontczak, Humanity Needs Dreamers is the cinematic version of the acclaimed one-woman theatrical show. As an immersive science film, this unique format breaks the wall between live theater and cinema, past and present, scholar and performer. Event includes post screening Q & A with filmmaker Jen Myronuk and science trivia with prizes! This film is highly recommended for adults, middle school and high school students.